pitches associated with Acme & Stub Acme threads. All SPTM’s will cut right and left hand threads in internal and optional external applications. Manufactured from solid carbide for maximum tool rigidity. 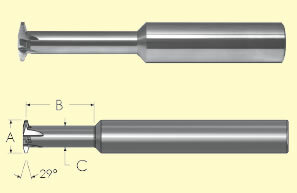 Long reach tools available from stock for unfavorable length to diameter ratios. Thread sizes available up to 1 ¼"– 5. Micro grain carbide uncoated and TiALN coated tools available. Single profile design provides a controllable pitch diameter and cut depth. Tools will cut both right and left hand threads. Low horsepower requirements compared to tapping. Produces very small manageable chips which are easily controlled with flood coolant. Designed for cutting internal threads.